Embark on a 15 day journey to experience the culture and discover the history that Mexico holds. 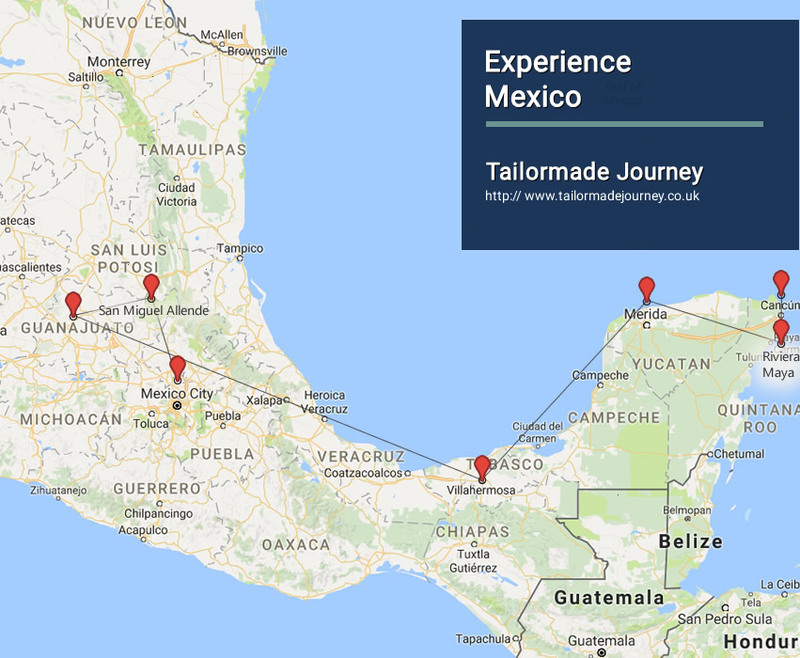 Make your way from Mexico City down to the Yucatan Peninsula to explore a wide range of exciting places including Guanajuato, San Miguel Allende, Merida and plenty of Mayan ruins. Visit markets, museums, churches, and parks that these sites have to offer. Overnight stay at the Hotel in Mexico City . You will be picked up in the hotel lobby for a full day privately guided tour (6-8 hours) of Mexico’s Historic City Center with visits to the Zocalo flanked by Mexico’s most important and buildings including: The National Palace, The Metropolitan Cathedral, a look from above into the Temple Mayor Aztec Archaeological Site, the Palace of Fine Arts (BellasArtes), and more depending on time and interest. This great square, called the Zocalo, evokes the place of homage and center of the world which was the heart of the ceremonial nucleus of Mexico-Tenochtitlan. You will continue on to the world renowned National Anthropology Museum where your expert guide will add contour and color to the myriad of exhibits with special attention on the Aztec and Maya rooms. Today you will be met in the hotel lobby for a 6-8 hour privately guided visit of Mexico City’s charming southern neighborhoods. You will visit the sites of most interest including the colonial suburbs of Coyoacan and San Angel. You will also have the opportunity of visiting the Xochimilco which is characterized by the existence of channels that gave a special dye in the Valley of Anahuac. This site, topography and flow from a series of springs at the edge of the mountains has allowed until now to be an attractive place with its canals, floating gardens, with flowers, adorned with trajineras. Time and interest permitting, you can visit the Dolores Olmedo Museum. You will be met in the hotel lobby for a privately guided tour of the stunning archaeological zone of Teotihuacan, famous for the world’s third and fourth largest pyramidal structures, the Pyramids of the Sun and the Moon. Your guide will enhance your experience with expert explanations of the importance of the site and its place in the rich history of Mexico’s many layers of pre-Columbian civilizations. Lunch is included. After Teotihuacan you will be privately transferred to San Miguel de Allende, a UNESCO World Heritage Site and home to gorgeous mansions with bougainvillea draped walls, luxuriant gardens and burbling fountains. Upon arrival, check in to your luxury hotel in the center of the city, Casa de Sierra Nevada by Orient Express. Overnight stay at the Hotel in San Miguel Allende . See colourful buildings and enjoy the parks of San Miguel, visit the Parroquia, the Oratorio, or any one of the numerous other churches in town, visit the Museo Casa de Allende; the house of San Miguel’s most famous son and namesake, the independence leader Ignacio Allende, which is now a museum. Also, turquoise and silver jewelry can be found in one of the many myriad shops. Overnight stay at the Hotel in San Miguel Allende. In the morning, you will be privately transferred from San Miguel Allende to Guanajuato. After settling into your hotel, your private tour guide leads you on a captivating journey through the winding streets and subterranean passageways of this UNESCO World Heritage city. View the grand Juarez Theater, the Alhondiga de Granaditas, and the cast-iron-and glass Hidalgo Market, designed by Gustave Eiffel. Then, tour a local mine to learn about the rise of the mining industry after the discovery of silver in the 16th century. Your driver and expert guide is at your disposal for 8 hours and will be glad to assist you depending on interest and time. Overnight stay at the Hotel in Guanajuato. Overnight Stay at the Hotel in Villahermosa . You will be met by your guide in the hotel lobby at for an unforgettable excursion (10-11 hours) to the remote Mayan archaeological sites of Yaxchilan and Bonampak located deep in the Lacandon Jungle. This tour includes the round trip boat trip (approximately 1 hour in total). Overnight Stay at the Hotel in Merida. Today you will head to the UNESCO World Heritage Site and World Biosphere Reserve of Celestun, an enticing spot for all naturalists, but especially for bird watchers as there are more than 200 species of birds to be seen here. Celestun is home to one of the largest migratory flamingo populations in the world. You will be picked up today for a privately guided full day tour of the archaeological site ofChichen Itza, one of the most awe-inspiring archaeological places you are likely to visit. ChichénItzá, the most famous Mayan temple city, served as the political and economic center of the Mayan civilization. After the tour, as you make your way towards the Riviera Maya, you will stop en route at Valladolid for lunch. Overnight Stay at the Hotel in Riviera Maya. Enjoy a privately guided tour to Sian Kaan Biosphere Reserve which is approximately 1.3 million acres in size and spans 120 kilometers, compromising almost one third of the Caribbean coast of Mexico. On the tour you will explore the channels, mangroves and estuaries floating quietly with a local naturalist guide before visitng an archaeological site in the reserve. After, return to your beachfront hotel to relax on the white sand beach. Sail and enjoy with us a spectacular day in the Mexican Caribbean. Explore the stunning reefs of Isla Mujeres, located off the coast of Cancun in the Mexican Caribbean. This boat tour invites you to discover the density of the tropical jungle, the Mayan civilization, the warm clear waters of Caribbean Sea and the beauty of this island of fishermen, Isla Mujeres. Transferred to Cancun Airport to board Flight for Onward Journey .